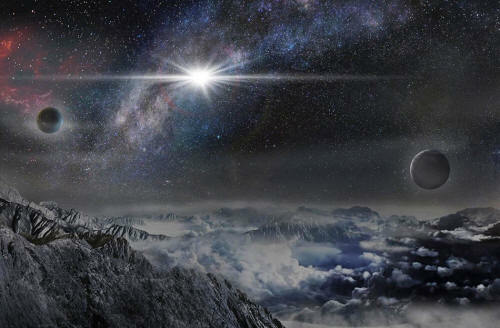 10,000 light years away in the host galaxy of the supernova. Records are made to be broken, as the expression goes, but rarely are records left so thoroughly in the dust. Stunned astronomers have witnessed a cosmic explosion about 200 times more powerful than a typical supernova - events which already rank amongst the mightiest outbursts in the universe - and more than twice as luminous as the previous record-holding supernova. At its peak intensity, the explosion - called ASASSN-15lh - shone with 570 billion times the brightness of the Sun. If that statistic does not impress, consider that this luminosity level is approximately 20 times the entire output of the 100 billion stars comprising our Milky Way galaxy. As described in a new study published today in Science, ASASSN-15lh is amongst the closest superluminous supernovae ever beheld, at around 3.8 billion light years away. Given its uncanny brightness and closeness, ASASSN-15lh might offer key clues in unlocking the secrets of this baffling class of celestial detonations. "ASASSN-15lh is the most powerful supernova discovered in human history," said study lead author Subo Dong, an astronomer and a Youth Qianren Research Professor at the Kavli Institute for Astronomy and Astrophysics (KIAA) at Peking University. "The explosion's mechanism and power source remain shrouded in mystery because all known theories meet serious challenges in explaining the immense amount of energy ASASSN-15lh has radiated." These two tiny telescopes sweep the skies to detect suddenly appearing objects like ASASSN-15lh that are intrinsically very bright, but are too far away for human observers to notice. "ASAS-SN is the first astronomical project in history to frequently scan the entire optical sky for optical transients," said Krzysztof Stanek, professor of astronomy at the Ohio State University and the co-Principal Investigator of ASAS-SN. "Every time in science we open up a new discovery space, exciting findings should follow. The trick is not to miss them." Subo Dong and colleagues immediately put out word about the sighting of ASASSN-15lh in order for as much data as possible to be gathered. Multiple, far larger ground-based telescopes across the globe, as well as NASA's Swift satellite, have since taken part in an intense observing campaign that continues to this day. In just the first four months after it went kablooie, so much energy beamed out of ASASSN-15lh that it would take our Sun in its current state more than 90 billion years to equal its emissions. By examining this bright, slowly fading afterglow, astronomers have gleaned a few basic clues about the origin of ASASSN-15lh. Using the 2.5-meter du Pont telescope in Chile, Dong's colleagues Ben Shappee and Nidia Morrell at the Carnegie Observatories in the United States took the first spectrum of ASASSN-15lh to identify the signatures of chemical elements scattered by the explosion. This spectrum puzzled the ASAS-SN team members, for it did not resemble any of spectra from the 200 or so supernovae the project had discovered to date. Inspired by suggestions from Jose Prieto at Universidad Diego Portales and Millennium Institute of Astrophysics in Chile and Stanek, Dong realized that ASASSN-15lh might in fact be a superluminous supernova. Dong found a close spectral match for ASASSN-15lh in a 2010 superluminous supernova, and if they were indeed of a kind, then ASASSN-15lh's distance would be confirmable with additional observations. Nearly 10 days passed as three other telescopes, stymied by bad weather and instrument mishaps, attempted to gather these necessary spectra. Finally, the 10-meter South African Large Telescope (SALT) secured the observations of elemental signatures verifying ASASSN-15lh's distance and extreme potency. "Upon seeing the spectral signatures from SALT and realizing that we had discovered the most powerful supernova yet, I was too excited to sleep the rest of the night," said Dong, who had received word of the SALT results at 2 AM in Beijing on July 1, 2015. The ongoing observations have further revealed that ASASSN-15lh bears certain features consistent with "hydrogen-poor" (Type I) superluminous supernovae, which are one of the two main types of these epic explosions so named for lacking signatures of the chemical element hydrogen in their spectra. ASASSN-15lh has likewise shown a rate of temperature decrease and radius expansion similar to some previously discovered Type I superluminous supernova. Yet in other ways, besides its brute power, ASASSN-15lh stands apart. It is way hotter, and not just brighter, than its apparently nearest of supernova kin. The galaxy it calls home is also without precedent. Type I superluminous supernova seen to date have all burst forth in dim galaxies both smaller in size and that churn out stars much faster than the Milky Way. Noticing the pattern, astronomers hoped this specific sort of galactic environment had something to do with superluminous supernovae, either in the creation of the exotic stars that spawn them or in setting these stars off. Exceptionally, however, ASASSN-15lh's galaxy appears even bigger and brighter than the Milky Way. On the other hand, ASASSN-15lh might in fact reside in an as-yet-unseen, small, faint neighboring galaxy of its presumed, large galactic home. To clear up where exactly ASASSN-15lh is located, as well as numerous other mysteries regarding it and its hyper-kinetic ilk, the research team has been granted valuable time this year on the Hubble Space Telescope. With Hubble, Dong and colleagues will obtain the most detailed views yet of the aftermath of ASASSN-15lh's stunning explosion. Important insights into the true wellspring of its power should then come to light. One of the best hypotheses is that superluminous supernovae's stupendous energy comes from highly magnetized, rapidly spinning neutron stars called magnetars, which are the leftover, hyper-compressed cores of massive, exploded stars. But ASASSN-15lh is so potent that this compelling magnetar scenario just falls short of the required energies. Instead, ASASSN-15lh-esque supernovae might be triggered by the demise of incredibly massive stars that go beyond the top tier of masses most astronomers would speculate are even attainable. "ASASSN-15lh may lead to new thinking and new observations of the whole class of superluminous supernova, and we look forward to plenty more of both in the years ahead." The preprint of the paper can be seen at "ASASSN-15lh: A Highly Super-Luminous Supernova"
A review article on superluminous supernova by Prof. Avishay Gal-Yam published in Science in 2012 "Luminous Supernovae"